Security is a priority for homes and buildings. Hence, homeowners do a lot to guarantee the safety of their lives and property. Electricity has a large role to play in home security and most residential buildings and commercial setting, need the services of an electrician to experience the benefits of electricity in security. One of the ways electricity enhances safety is through lighting. Outdoor lighting is strategically installed to deter crime in the environment and discourage intruders. Another way is the use of alarm systems, automated security systems, and gate intercoms. A gate intercom is installed at the gate or entrance of your home. It is used to establish communication with a visitor and grant entry to the building. Gate intercoms are used in any building and are extremely helpful for security. They come in various designs and variation such as those with two-way communication, video, fingerprints, keypads, and much more. A gate intercom keypad is a set of keys attached to a gate intercom. It enables the owner and other familiar persons to type the password and gain entry even when there’s no one in the building. It adds extra convenience to the flexibility of gate intercoms. The keypad can stand alone or be built in, it is often weatherproof to protect the device function. The outside station of the intercom should be sealed for bugs and weather. Use the proper cable and ensure the wiring is installed properly for power to reach the device. Install low voltage wiring for intercoms using correct sizes of cables. Intercoms usually require 2-4 wires for the entire installations. Purchase intercoms that are weather resistant for outdoor use to prevent damage. Inform your family members about the password and its importance. Tell them how to use the intercom by simply dialing the password to gain access to the building. If the password becomes compromised, it should be changed and the necessary security measures are taken. You can reach us at Secure Tech for your home intercom installations. We are experienced and professional with such low voltage installations. You are assured of quick completion and an efficient system. Security is an important subject for homes and buildings. Everyone wants to go to bed at night with both eyes closed and wake up happy. Unfortunately, if you do not take the necessary steps, you cannot have such a luxury. Security and safety is something that must be invested in if you hope to protect the lives and property in your building. Technology has made it possible to equip commercial buildings and homes with security installations. Here are 5 tips to help you make the right choice. Several companies offer this technology with different benefits. It allows you to monitor the activities at your gate and also control who can come in. Gate access control with a camera gives you a clear view of the environment and is a great way to improve security. Lights are a simple but effective way to deter intruders from entering your home or building. Outdoor lights are used for this purpose and can be installed by a professional electrician. You can use movement activated floodlights or sensor lights to detect suspicious movement around the home. Ensure that the lights do not disturb the neighbors or confuse road users. An electrician from Captain Electric, LLC can provide you with a professional opinion on what works better. It is never ideal to leave your spare keys under the mat or in a flower pot. You can invest in an automated wall-mounted key safe that is strong enough to withstand sawing and hammering. It should be installed in a discreet location. This wall safe will make it easier for relatives and service providers to access your home in your absence. Smart houses are safer than a regular home. The various installations present allow owners to control their home or building from any location. Lights can be set on timers, the alarm system can be controlled, and the home can be monitored, and so on. Investing in a smart home is worth it for the added security and peace of mind. You can check different companies for products that would suit your home. Banks have high-security systems but yet keep precious items in vaults. Sometimes, security has a lot to do with your efforts. If you have valuable items, keep them out of sight. Avoid actions that make you a target for intruders. Most security installations like having a gate access control with camera, need to be installed by an electrician with experience. Hire a licensed electrician who equally specializes in security installations for homes and commercial buildings. They have to be fixed properly to be effective. You can hire a good electrician at Secure Tech. We are professional, licensed, and experienced to offer you satisfaction with our service. Developments in technology have greatly influenced the way of living in the 21st century. With constant advancements in tools, devices, and so on, it is only natural to benefit from what our fast-paced world has to offer. Intercoms are one of such devices created from technological developments. They are unique and have proven to be highly useful to homes, workplace, and much more. An intercom is sometimes called a talkback or door phone. They can be installed in any parts of a building including gates, rooms, and doors. An intercom allows two or more people to communicate effectively without being in the same place. 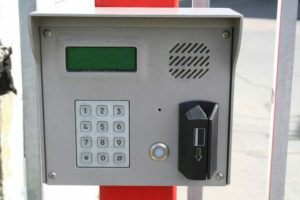 For example, a gate entry intercom allows homeowners or commercial buildings to communicate with visitors at the gate. 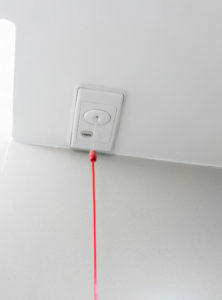 The device can be connected to loudspeakers, walkie-talkie, or telephones. Intercoms can equally be linked with cameras or CCTV to give a better view of the environment. How can gate intercoms offer safety? Gate camera intercoms have a video system that allows you to know what is going on in your front entry anytime. You can monitor suspicious movements with the device. Gate entry intercom can require anyone to provide a form of identification before being allowed into the building. This helps to boost security by deterring intruders, criminals, or unauthorized persons from entry. You may wish to communicate with a person outside the gate before granting entry. This is important for safety and security and having a gate intercom can offer you such convenience. A gate intercom is an invaluable device and can provide benefits in other areas aside from security. It enhances comfort and efficiency. Schools, offices, or industries can communicate with all workers or those in certain rooms using intercoms. To fully enjoy these benefits, you would need a proper installation of your gate intercom for homes or commercial buildings. You can hire a professional and experienced electrician at Secure Tech for gate intercoms installations. We are glad to assist you with our quality installation and electrical services at any time. 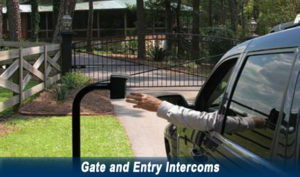 Audio and video intercoms installed on gates allow for communication between you and your guests. These intercoms are not only equipped with audio and video communications but usually have a trigger for a gate opener to allow visitors inside. Gate intercoms can be hardwired or wireless. More advanced models also have built-in card readers or keypads to allow access from expected guests. Audio and video intercoms are great additions for apartment buildings and commercial offices. It’s easy to see the perks of installing a gate intercom. The security feature alone is enough to sell anyone, but what if you’re still not sure. Just think of the convenience of not having to go down flights of stairs to allow your guest in. With a click of a button, you will be able to see and hear your guests. Another click and the gate will open to allow entry. Safety in any situation is important. Pair that with convenience and there should be no question. Installing a gate intercom is the best option when it comes to securing your home or business. Contact a professional electrician today to get started! Secure Tech’s focus is on the needs of our customers and we offer a full range of installation and maintenance services. We install and service all types and brands of security equipment including gate intercoms. Think about the last time you were in a hospital, whether for yourself or a family member. There are so many sounds you hear when you’re walking through the hallways or in the patient rooms. One of those sounds is the sound of a nurse call system. Nurse call systems are installed in healthcare facilities and senior housing to alert the nurses to the fact that they are needed in a room. If you’ve ever been to one of these facilities, you know how important a reliable system can be. It has a day-to-day impact on operations and the experience of patients. Many healthcare facilities and offices work with electricians to provide a custom built configuration to get the most out of a nurse call system. Many systems allow for patients to call the nurses straight from their bed. There are also smart beds that are equipped to send out alerts to the caregiver is something seems off. There has been a great advancement in the technology aspect of healthcare. Nurse call systems have come a long way and now include innovations such as surveillance and staff locating. These elements help to improve a caregiver’s efficiency and workflow. Also known by the name of call bell or call light systems, nurse call systems are the center of communication for an emergency situation. Nurse call systems are an integral part of any hospital or hospice. With that being said, they must be set up and installed properly to be reliable. Without these systems in place, many hospitals or hospices fail to provide the best treatment for their patients. Many states require the systems to meet a strict set of codes in order to pass inspection. Every nurse call system must use UL® Listed components. Installing a nurse call system can become very complex. An electrician can provide the best recommendations for specific situations. Secure Tech has been providing expert low voltage electrical services to the Santa Clarita area for years. We specialize in installing nurse call systems in any situation. Secure Tech has deep experience with Nurse Call hardware providing service, installation, and maintenance. Contact us today if you are interested in getting a quote!